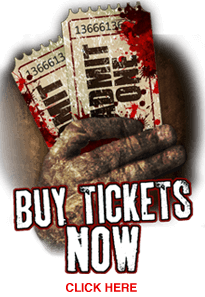 Haunted Backwoods in London Ohio is one of the best rated haunted houses in all of Columbus Ohio and beyond, with a Backwoods Village, a Trail through The Woods, Zombie Graveyard and more. Click now to learn more about this MUST SEE haunt. Haunted Backwoods in London Ohio is one of the best rated haunted houses in all of Columbus Ohio and beyond, with a Backwoods Village, a Trail through The Woods, prowling animals in The Dark, Snake & Spider Shack, Zombie Graveyard, Gypsy Hideout, Voodoo Shack, and CIRCUS in the Huge Barn. For 25 years Jane Davis has been passionate about Halloween. She has decorated her 100 year old Victorian house every year into the "GO TO" SCARE for hundreds of young and old local residents. She has toured and studied hundreds of haunted houses. Three years ago she opened a haunted trail in the Georgia mountains. It is a 100% customer satisfaction haunt. Now she has the PERFECT 10 acre WOODS in Ohio, The HAUNTED BACKWOODS, ready to scare, haunt, thrill and horrify all who come to visit! Loved it. So much to do. So much scary fun.